A U-shaped lever handle, which should be used on latch doors. Hardware should be placed in approximately the same position on all doors, 800 – 1,100 mm above the finished walking surface. This hardware should also be colour contrasted to the door’s surface. For door-opening hardware, use lever door handles with returned ends, D-handles, push-plates or offset push-plates. Offset push-plates are preferred because they indicate the direction in which doors open. 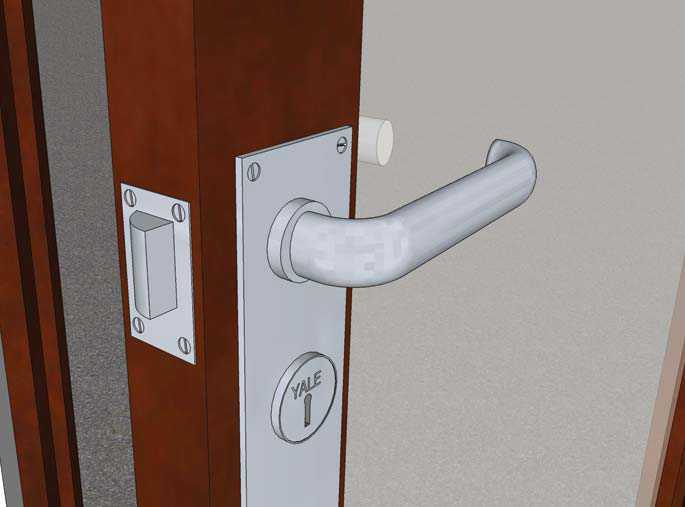 Tactile hardware (e.g., push plates or handles) should be installed on the push side of doors without latching devices. This will aid users in locating the proper place to push to open the door and, in the case of doors in glazed partitions, locating the door itself.